The skill evaluation aims were: drawing within timescale, observation, line work, and discipline to which I feel I completed all within a satisfactory level. In this post I will discuss both my strengths and weaknesses relating to these aims. With roughly 1h30m, I feel the timescale was generous enough to draw the entire view with the most important lines. A class in orthographic and technical drawing in high school made me comfortable with this exercise in timekeeping, making sure I put in the main lines in first, then worked down towards the details. I then gave myself ample time to correct and clean up lines. I spent about 5 minutes just choosing a place I wanted to draw, something that would be interesting and that included enough elements to make a strong drawing. This corridor had a number of wall parts sticking out as well as doors, windows and pipes along the roof. I picked a challenging spot sitting so close to the wall which gave for an interesting view of the corridor. Luckily there was a seat and table conveniently located in the corridor so that was fortunate. 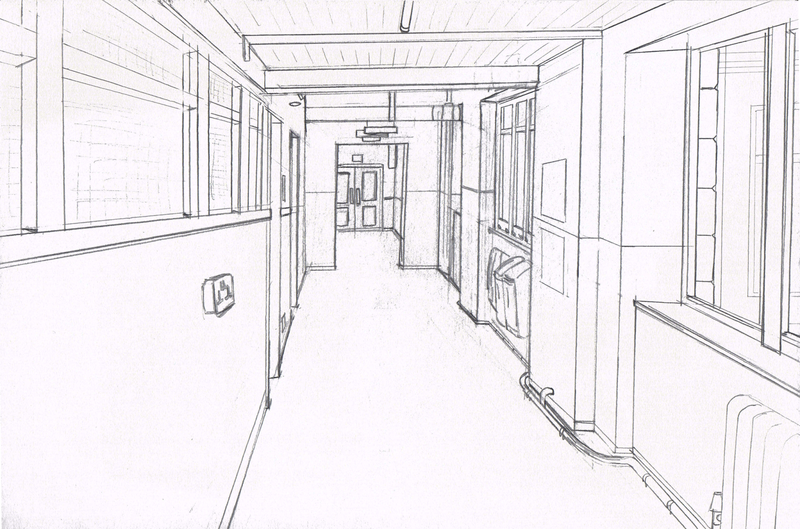 Lines are the main ingredient to a perspective drawing. I used a variation of pencils: a 2B, a 0.3mm and a 0.5mm technical drawing pencils. I also used a ruler to help with time efficiency and to make the lines cleaner and easier to work with. I tend to prefer a single straight line rather than drawing the line several times on top of each other to get a result. Overall I’m pretty happy with my finished drawing. If I were to move on from here I would like to try different perspectives or angles to draw from. Moving on from the single corridor setting I could try a location with pillars or more complicated geometry to add an extra challenge. The drawing’s not perfect though, I could have stepped back from the drawing more to make sure the lines and proportions were better. There is slight distortion in the corridor particularly in the roof at the top right.